Samsung washer door will not open. When the wash cycle completed the door does not open. It is locked and not allowing the door to open. What is needed to open the washer door? Is there a specific button on the washer to override the door lock? This issue has occurred once before but after about 5 minutes of finishing the wash cycle the door would open. My Samsung front load washer did finish the cycle. However a small amount of water was still in the washer. The washer has a water level sensor so if there is water in the tub it is impossible to open the door until the water is drained. This causes the Samsung washer door to not open. Has your Samsung washer been interrupted during mid wash cycle? If so there may be a large amount of water to drain out and may take from 10 to 20 minutes to drain out. The washing machine door will be locked when it detects water in the unit. Wait and see if it drains out by itself. When water is no longer in the washer, reset the washer by pressing the ON/OFF or START/PAUSE button. Then wait for a minute to pass, and you can then unlock the door. 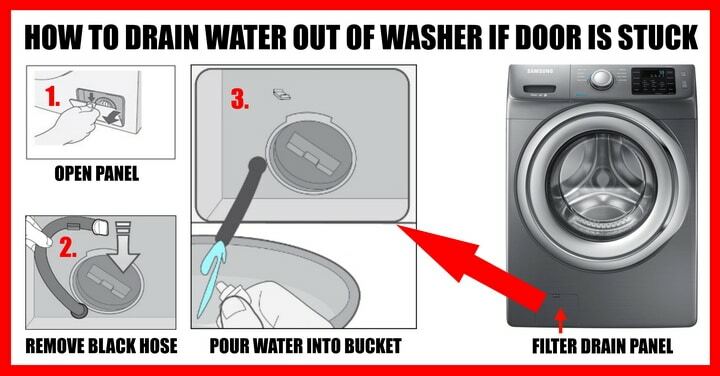 If this does work you will need to MANUALLY DRAIN the water out of the washer to be able to open/unlock the door. If your washer door does not open and there is water in the washer tub, you will need to drain out the water within the washer by using the small rubber drain hose near the debris drain filter. When your washer door is locked and water is in the tub, you will need to manually drain out the water by using the steps below. If there is NO WATER in the wash tub and the door is locked after finishing a cycle, see below for TROUBLESHOOTING as to what may be the problem. SAFETY: Before proceeding with the manual drain procedure below, be sure that the water in the washer tub is not HOT as burns can occur. It is best to wait from 30 to 60 minutes for the hot water to cool down. Locate the debris filter panel on the front bottom of your washer – Usually located on the bottom right on most Samsung front-load washers. Pop open the panel on the debris filter – Press down on the small tab on the panel and pull the panel downward. If the panel has no tab to pull down on, carefully use a flat head screwdriver and gently pop the panel open. Once you have the panel open find the small rubber drain hose. Release the small rubber drain hose if it is in its holder. To absorb any water that may spill when draining the washer, use a large bowl and some washcloths if any spills do occur. Once you have items to absorb any spilled water, get your large bowl and place it under the small rubber drain hose and place washcloths around it. At the end of the small rubber drain hose you will see a white draining plug, take it off and drain all the water out of the washer and into your large bowl to catch the water. It may be difficult to remove the white draining plug. To remove the white plug on the small rubber drain hose – Simply PULL and TWIST to remove. Once the water has stopped draining from the small rubber drain hose, put the drain hose cap back on and then snap it into the holder. Snap the debris filter panel back into the holes below and then lift up and push it back into place until it snaps in. Power the washer OFF and then back ON to reset it. Once this is done the door should unlock. 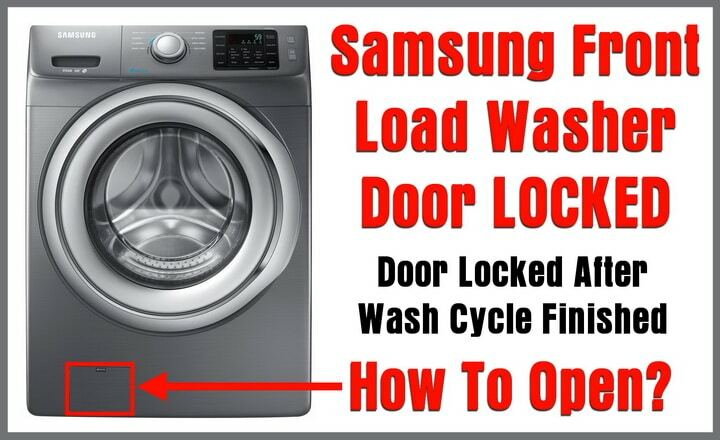 If your Samsung front-load washer door does not open after a wash cycle completes, and no water is inside the tub, you may have a faulty door lock assembly, bad wiring to and from the door lock assembly, a cracked or loose door/door lock assembly that causes the washer door to not operate properly, a faulty control board, bent washer door hinges, or faulty control board wiring. 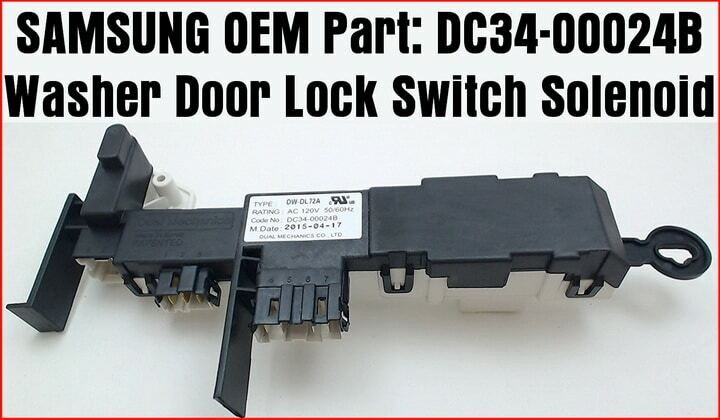 Check the wiring from the door latch assembly to be sure a damaged wire is not causing the issue. Inspect the door hinges, latch assembly, washer door latch for any signs of cracks, parts that are bent, or damage, as an item that is damaged may cause the washer door to lock and stay locked after wash cycle finishes. Inspect the control board to be sure there are no burnt or scorched areas on the board or elsewhere as a bad control board can cause the door to not open. When you hear a click at the washer door, this means that the solenoid is receiving power and is engaging or disengaging. If the washer door won’t open and you hear a clicking sound at the door, this could mean that the solenoid is not fully opening to let it unlock, or possibly there is a mechanical issue with the latch, or the washer door is bent downward in such a way that it still hangs onto the latch and won’t let it unlock because of the pressure on the latch. See if lifting up on the washer door when opening the door helps. Need help with your Samsung washer not opening the door? Please leave a comment below and tell us your model number so we can assist. my door handle has broken so now i cant get door open to remove wet clothes.how can i get the door open?? ?.Please help. samsung wf7700n6w front loader. Washing machine kept tripping the safety switch and will not turn back on. The door is locked with washing inside. There is no power to the machine and I am unable to plug into socket as it trips the safety switch. Any tips to open it other then breaking into it. Before you do anything, not one person mentioned the CHILD LOCK. I’m not sure how ours became activated, but it did. Once I deactivated it the problem was solved. My washer goes thru cycle. At the end the door doesn’t unlock. The child safety lock stays on. I have to unplug machine for two (2) days to get laundry out. I actually bought a 2nd hand Kenmore as I can’t find anyone to fix the Samsung. They all say parts very expensive and not WORTH fixing!!! I found my locked Samsung door was caused by a melted lock unit. Samsung wanted $300 to fix after breaking the door. THANK YOU! I just wanted to add that you might need buckets for this one. I just drained 5 gallons out of my machine, I was expected only a few ounces. Samsung Washing Machine, model WF45H6300A/6100A: We have had this problem before, where the switch solenoid was replaced by Samsung. Recently, the door won’t close/lock even when I pushed and held on for a while. I took out the solenoid latch and found out the piece that locks on the door hook was not rotating into lock position. I pushed it into place with my thumb and it stayed. I put it back together and the door locked. After the first wash cycle the door remained locked and would not open. Now I can’t open the door at all. There is no water in the machine because the cycle completed successfully. How can I open the door so I can replace the switch solenoid?